Sumiya-Bunjiro Shoten award winning mirin has been traditionally produced since 1911 and continues to be made with 100% natural ingredients with a minimum fermentation time of one year. The premium quality derives from the patient combination of rigorously selected sticky rice, koji and shochu spirit. 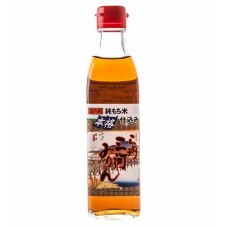 Mirin manufacturers usually add sugar during the rice and koji fermentation process with additional cane sugar alcohol to speed up the maturation. Here, nothing is added, the production process is slower resulting in authentic strength and flavours that are well balanced, natural and pure. Mirin is used to provide a subtle sweetness to both sweet and savoury dishes, it is the base for many sauces and dressings. Mirin will also tenderise meat and reduce strong aromas of seafood. A premium quality mirin derived from the patient combination of rigorously selected sticky natu..